A mixture of different examples of my artwork. All drawn in oil pastel on paper, on cardboard. I am preparing work I will be submitting to the Jerwood drawing prize. 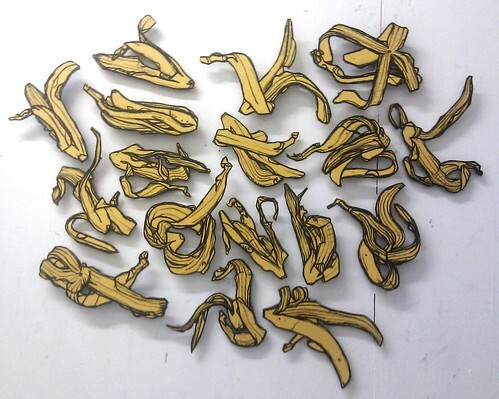 This drawing of banana skins is very similar to a piece of work I made for LaPieza gallery in Madrid. I would prefer to mount each banana skin on the wall individually, but for practical reasons I will need to mount this work on a white board for transportation to the competition. Each drawing is on yellow cartridge paper, which has been glued to cardboard cut from old boxes. When mounted each drawing will be raised up from the mounting board on a chunk of thick cardboard. 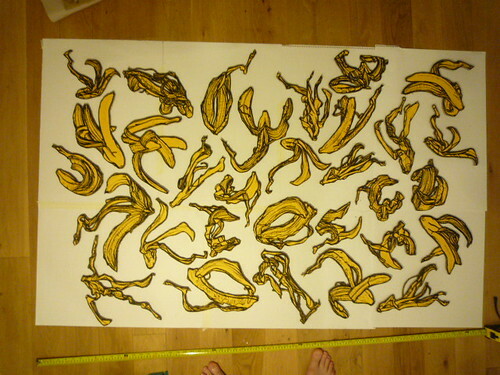 Using different coloured paper I’ve continued to draw banana skins. This yellow paper is relevant to the kind of colour normally associated with banana skins. More of these yellow banana skin drawings will be added. 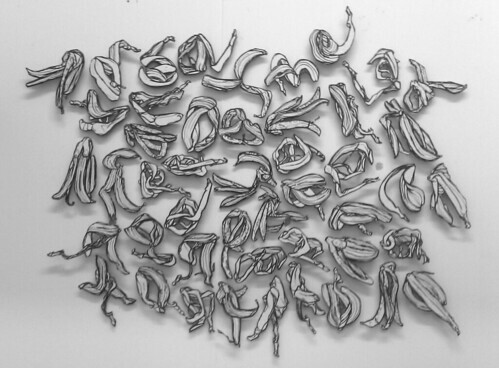 Life-size drawings of banana skins, raised out from the wall. Banana skin drawings in yellow. Black oil pastel on paper on cardboard.